Letting your children play outside the confines of the walls of the home and get out into a much bigger space is not only a way to let them release their high energy levels. This is a very important part of their childhood which provides them with a very good opportunity to develop their physical strength, coordination, and balance. Along with this, this is also a chance for them to interact with other children their age and develop skills that will be essential as they grow and mature. One of the most important things that children can achieve from playing out in playgrounds is social skills. By playing with other children in a playground environment, they will be given a good chance to communicate, share, and empathize with others. Along with these aspects, are the development of their sense of self where they master skills and abilities which will later prove to be their strengths in the future as well as their sense of connection to the place, to their peers, and to their local community. Aside from cultivating their interpersonal skills, they are also able to work on their intrapersonal skills. Two of which are imagination and creativity, as they will have to be creative on which and how their games will be played in the playground. In line with this, is also its big contribution to the building up of their thinking and problem solving skills as the child is able to assess the risks and challenges that will tackle and then learn to become persistent and persevere in overcoming these challenges. It is for all these reasons that play grounds and play spaces are very vital for every child. To further their development and growth, provide specific areas in where a child can be active and free, can sit down and be quiet, and areas for social, imaginative, creative, exploratory, and natural play. Aside from picking out the right space to create your playground, more importantly, it should contain all the best play things and toy sets to facilitate a good, enjoyable, and safe play. What would be a better system to use in furnishing that perfect playground than a Gorilla Play Set? Gorilla Play Sets are ready-to-assemble play pieces that are specifically designed for outdoor use. Made with the most suitable hand-selected cedar, they have been made in a way that they can easily be assembled with only the use of the simplest tools available at home. Each of its components have been pre-cut, pre-sanded, and pre-drilled and have been provided with the necessary accessories (with availability to purchase many fun optional accessories) and detailed instructions for its proper and efficient assembly. Each of the pieces that are contained in the play set have been obtained from lumber that conforms to all national standards and regulation. They are beautifully stained and finished not only for its aesthetic appeal but also to protect it from all the harmful elements outside the comforts of the home. Safety is one of the most important issues with play sets and Gorilla Play Sets have made sure that they give their play sets extra attention in these areas. These free-standing designs boast sturdy structures with heavy-duty frames, iron-ductile hangers, and powder-coated chains. Exceptional value, quality, and play are what the Gorilla Play Sets offer every child. From their swings to their trapeze to the awesome wave slide, every child should be physically active, healthy, and entertained at the end of every playtime. 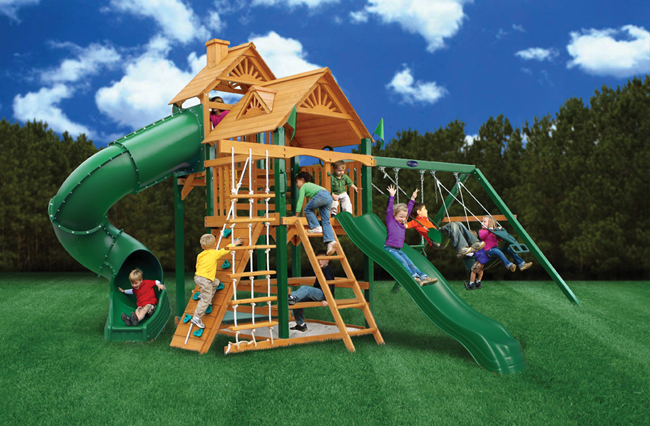 This brand’s wide selection of play sets should give any child with the physical activity and imagination that they will need, right in the safety of your own backyard. A well-planned and well-designed playground is a fundamental component in every play area. More often than not, this will be a well-used and highly valued home asset so it is important that it should contain no hazards and risks for injuries that can be very dangerous to young children. The site of your playground will have a very big say on how it will greatly affect the entire playing experience of a child. It is therefore important that you consider some very important points with site selection, even if you only plan to put up the playground in your own backyard. Ensure that anyone – whether a parent or a child – is able to gain easy access to the playground without the hazards of busy streets and roads. Also take note of shades such as the presence of mature trees that would come in handy to take a break during scorching days. Ensure that there are no other environmental hazards like slopes and hills, drainage and water hazards, and other potential dangers such as the presence of poisonous vegetation or nearby industrial hazards. One important consideration that you should take note of is adequate supervision. There should be spaces in the play area where adults can sit on the shade or in seating areas and maintain lines of sight of the children that are playing on the play sets. Also consider the number of children that will be playing. Having play sets like the Gorilla Play Sets Woodbridge with its ability to accommodate up to 10 children, should be a good choice if you are looking for something that can be used for children in the neighborhood or that extra large family! Safety on the equipment is also another essential factor in the planning and designing of a play area. Although there are play sets that promise to provide a safe environment for young children, it would be a good move to equip play sets with additional padding and support for that much needed peace of mind. The quality of these support material should be a top most consideration of course, as you would not want them to wear off easily and quickly. Making an investment in these seemingly small and insignificant pieces could make that very big difference in proving an area for your child that is out of harm’s way. The vinyl Gorilla Play Sets Play Set Accessory Safety Pad with its 1-inch thick padding, should give that much needed stuffing where softer areas are needed. While there are guarantees for those play sets that are made for children have been equipped with the necessary amount of filling that; sometimes, you might feel that these are just not enough to keep your baby protected. Such additional padding should already be more than enough against those inevitable and sometimes unexpected bumps and hits from these play sets. If you are looking to provide a more safe area under swing sets and play sets, putting rubber mulch on these areas just like those of Gorilla Play Sets Rubber Mulch would be a very good idea. The areas under swings, most importantly are highly prone to falls brought about by the oftentimes rowdy playing of children. And with their imaginative minds and their keenness in experimenting, it cannot be prevented that they will try out actions that could prove to be very hazardous and highly prone to falls and other accidents. Active and free play areas are essential in the development of your child’s physical strength. This is a space in the playground where they can swing, slide, climb, hang, balance, and jump, among all the many other possible activities that they can do. The Gorilla Play Sets Big Sky I should be a very good play set to include in the design of your playground. This is made with preserved wood that features tongue and groove wood roof with sunbursts, dormers, and a chimney to complete the whole look. Containing a trapeze bar, two swings, two slides, a rock wall with climbing rope, safety ladders, sandbox, and safety handles; your child should get those muscles working with the variety of things that they can do. For a little downtime, the extra features of this play set offer some educational and imaginative play choices. With the telescope, periscope, steering wheel, tic-tac-toe panel, and built-in kitchen table; this Gorilla play set is a very good choice. If you currently own a Play Set and would want to give it a little more oomph, purchasing additional accessories for it would be a very good idea. There are so many play set add-ons that you can choose from which should further enhance and make more enjoyable their play time as well as provide them with more physical activity. Looking for a little more action to get your little one to expend that extra energy? Getting him with a Gorilla Play Sets Play Set Accessory Punching Bag just might be a very good idea. This safe and healthy punching bag is very soft to the punch and yet is durable enough to be subjected to the harsh elements in your backyard. Your child should have no problem showing off that little boxer in him with this accessory that comes in four different colors.